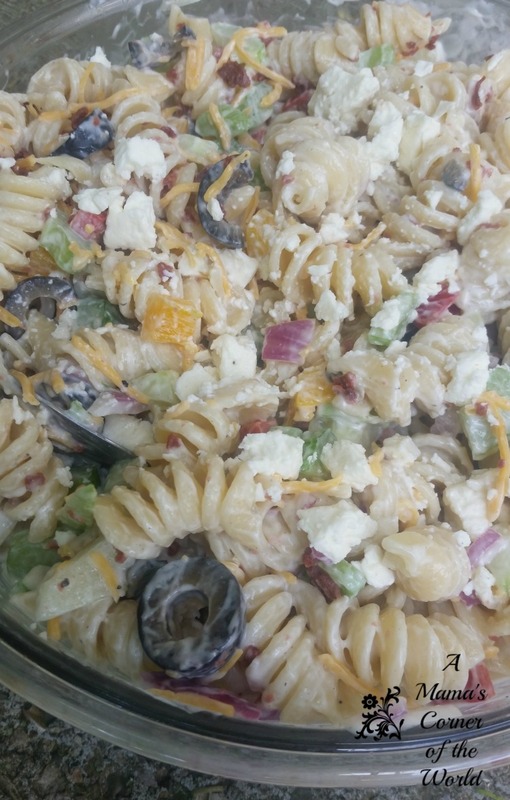 Looking for a Greek themed pasta salad recipe? The first sunny, almost warm weekends of March inspired the urge to fire up the grill and create a new twist on the usual family pasta salad recipe. In the words of my husband, it was time to take my traditional pasta salad recipe, in spite of rave reviews, and kick it up a level from the same old/same old. He was calling my pasta salad same old-same old? Yeah, I decided he was right. It was time for something new. 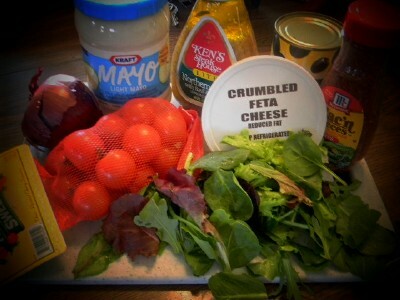 He mentioned using salad shells instead of my usual tri-colored spirals and a northern Italian style salad dressing instead of my usual dressing mixture…fresh spinach and feta cheese sounded good to me. A new Greek inspired pasta salad recipe was soon born. Prepare pasta according to package instructions. Cook pasta as directed. Drain and rinse with cold water until pasta has cooled. Mix pasta salad dressing mixture. Combine the mayonnaise, salad dressing and sugar in a large mixing bowl. Mix with a whisk until well combined. Add pasta to Greek pasta salad dressing mixture. Add pasta to mixing bowl of dressing and toss with a large mixing spoon until coated with mayo mixtures. Add vegetables and bacon. Add the onions, olives, tomatoes, spinach and bacon bits to the bowl and mix to combine. Garnish and serve. Sprinkle crumbled feta cheese over the pasta salad. Sprinkle with pepper and serve. We serve with grilled pork loin or chicken (seasoned with garlic, black pepper and olive oil), peas (seasoned with butter and oregano), and grilled Texas toast style garlic bread. I think this may be my new "same old-same old" pasta salad recipe--at least for this summer! Enjoy! Note: This recipe was originally posted in 2011. It has been updated with some new photos and text.